NEW YORK, NY – July 24, 2012– Cooper’s Pack Publishing – Children’s Travel Guides and Travel Books for Kids releases their 2nd Edition, London Travel Guide for Children available in eBook format, just in time for the London 2012 Olympic Games! A perfect traveling companion for those attending the London Olympics, anyone who wants to follow along from home, or future travelers who want to learn about one of the world’s great cities. The Cooper’s Pack London Travel Guide features over 500 pictures and noteworthy facts about London, all told through an engaging and entertaining story line. Traveling stuffed animals have more fun, especially in London! Cooper tours London with his new friend (and London hipster), L.L. (Little Lambie). After a visit to Covent Garden and Somerset House, Cooper hits the London Eye, Big Ben, Buckingham Palace and many other sites. Lucky for Cooper, L.L. knows how to navigate the city by Tube, taxi, and train (not to mention walking). The interactive eBook includes a multitude of buried bones (hidden secrets) that users can hunt out by clicking on areas within a page, along with advanced “fun fact” pop-ups with additional information and pictures. Like all Cooper’s Pack books, there is also an educational and activity section highlighting everything you would want to know about London, especially if you are between the ages of 4-12. Check out the eBook offerings for the iPad, iTouch and iPhone available on the Cooper’s Pack website at http://cooperspack.com/store/interactive/london-interactive-travel-guide/ , or download directly on the iTunes App Marketplace at http://itunes.apple.com/us/app/id543380097?mt=8 for $1.99 per book. The website and series of books create a memorable and rewarding journey where kids can follow Cooper and his adventures around the world, highlighting the cities he visits and the friends he makes along the way. 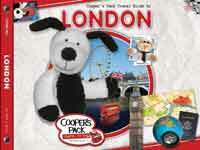 Cooper’s Pack has launched four children’s travel books featuring London, Seattle, New York City and Alaska. Learn more about these great travel and gift books at www.cooperspack.com. For more information visit the Cooper’s Pack website: www.cooperspack.com. Be sure to like our Facebook: http://www.facebook.com/CoopersPackTravelGuides. Follow us on Twitter: @CoopersPack. Interviews with Brandon Rudd, Cooper’s Pack Publishing are available! Cooper’s Pack author Brandon Rudd discusses Cooper’s Pack Travel Guides and traveling tips for kids on the Daytime TV show. The show was broadcast on June 12, 2012. NOTE: The interview begins 16 minutes into the radio broadcast.